VEFCA, S.L. is located in Miranda de Ebro (Burgos, Spain). Our tasks are to construct, maintain and repair vehicles used to work on the railway such as light trucks, maneuvers machines and bimodal or mixed circulation vehicles. 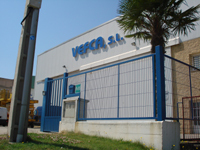 Vefca, SL is one of the most relevant firms and longer settled in Spain among those related to special railway machinery. Our experience and deep knowledge about the sector sets us in an advantageous and competitive position in order to collaborate in the renovation process that some of our customers are carrying on. In spite of ADIF is one of our main customers, it is not the only one, as we have a wide bunch of trusty customers who work for ADIF. Our machines are designed to support without problems long hours of hard railway work.